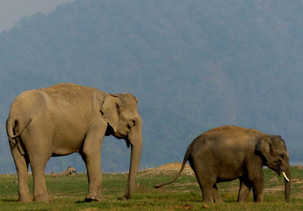 Elephants are one of the keystone species of Corbett Tiger Reserve and are frequently seen in the Kosi river valley adjoining 'NAMAH'. Many of our guests have seen these 'gentle giants' crossing the river and disappearing into the thick forests of 'Corbett Landscape'. These majestic creatures are regularly observed by 'NAMAH' guests on the game-drives to Jhirna, Bijrani, Durgadevi and Dhikala tourism zones of Corbett Tiger Reserve. When the dinosaurs disappeared 65 million years ago during last mass extinction, a tiny mouse size creature survived the catastrophe, probably hidden under the rocks or in the caves. This rodent-like creature was to evolve into animals that we today know as Elephants. Around 40 million years ago, a 10 ton creature, distinctly recognizable as an Elephant with downward curving lower tusks called 'Deinotherium' (terrible mammal) appeared. This creature was one of the largest terrestrial mammal that had ever evolved. One of the most commonly known pre-historic Elephant is 'the Wooly Mammoth' that roamed Siberia and Alaska towards the end of last ice age, some 10000 years ago. Present day Elephants belong to family 'Elephantidae' and order 'Proboscidia' and are distantly related to 'Hyrax', a rodent-like, herbivore terrestrial and arboreal mammal and herbivorous aquatic mammals like 'Dugong' and 'Sea Cows'. There are two species of Elephants that are found presently, one each from Africa and Asia (African Elephant Loxodonta africana and Asian Elephant Elephas maximus). The historic range of Asian Elephant is known to be as far west as 'Tigris' and 'Euphrates' river valleys in present day Syria and Iraq to the 'Yellow' river valley in China, South and South-east Asia. Presently the Asia Elephant is found in South and South-east Asia including parts of Southern Yunnan (China) and Sri Lanka. Indian Elephant E. m. indicus , a sub-species of Asian Elephant, has some distinct populations. The northern population ranges in the western Himalayan foothills from Dehradun to Nepal in Uttarakhand and Uttar Pradesh. The north-eastern population is found from Sikkim, north Bengal, Assam eastwards till Mishmi Hills in Arunachal Pradesh, Nagaland, Meghalaya, Manipur, Mizoram and Tripura. The central population occurs in south Bihar, south Bengal, Jharkhand, Chhattisgarh and Orissa. The southern population has its presence in Western Ghats and parts of Karnataka, Tamil Nadu and Kerala. Throughout its range, the Indian Elephant is subjected to immense pressures including poaching, man-animal conflict, loss and fragmentation of habitat. It is listed as 'Endangered' by IUCN with less than 25000 animals surviving in the wild. 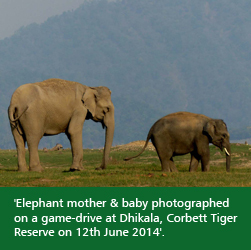 "Elephant mother & baby photographed on a game-drive at Dhikala, Corbett Tiger Reserve on 12th June 2014"